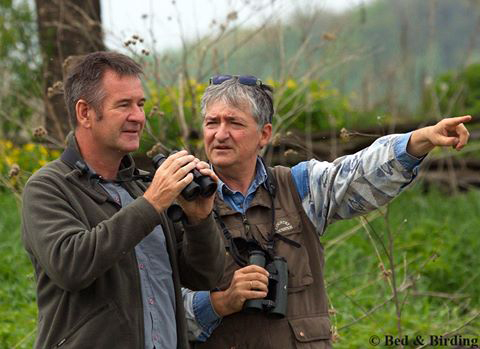 Bed & Birding founder, Pavel Simeonov, shows Nigel Marven some of the sights in Pripyatsky NP, Belarus. As a veteran presenter and producer of wildlife films, with a particular interest in birds, it was a source of real inspiration that I discovered “Bed & Birding” – en entirely original enterprise conceived and developed by my good friend Pavel Simeonov. Pavel and his wife Tatyana operate Branta Birding Lodge in Durankulak, northern Bulgaria – a fantastic lakeside accommodation (birth place of Bed & Birding concept) and top birding spot in its own right. At the same time Pavel’s associate, Paul Goriup, is another giant in bird tour management, promotion and conservation (the first conservation director of ICBP, now BirdLife International). Paul and his wife Natasha manage the Anglo-Ukranian ecotour company, Salix, that is based in Odessa. They have been organizing and leading nature tours around Black Sea for over 18 years, having their own accommodation in the Danube Delta. Bed and Birding is a well though-out complement to Pavel’s activities within wildlife tourism and conservation, designed to provide a global network of eco-friendly accommodation establishments that serve the full needs of birdwatchers. The network is growing rapidly, recruiting partners from both sides of Atlantic, and both hemispheres alike.